Sycamore Racing V's Jessica Krupnick, one of the leading horses as the 2018 MATCH Series nears its conclusion, is a product of a successful Pennsylvania partnership endeavor that began in 2011 and has a few graded stakes victories on its ledger. Franny Abbott of Abbott Bloodstock in West Chester, Pa., and his son, Tres Abbott III, a Fair Hill-based trainer, purchased two yearling fillies that year and one of them, Nellie Cashman, became a graded stakes winner of almost $350,000 in four seasons of racing. They also arranged for the purchase of the Irish-bred filly Medea, who also went on to win a graded stakes after her arrival in the United States. 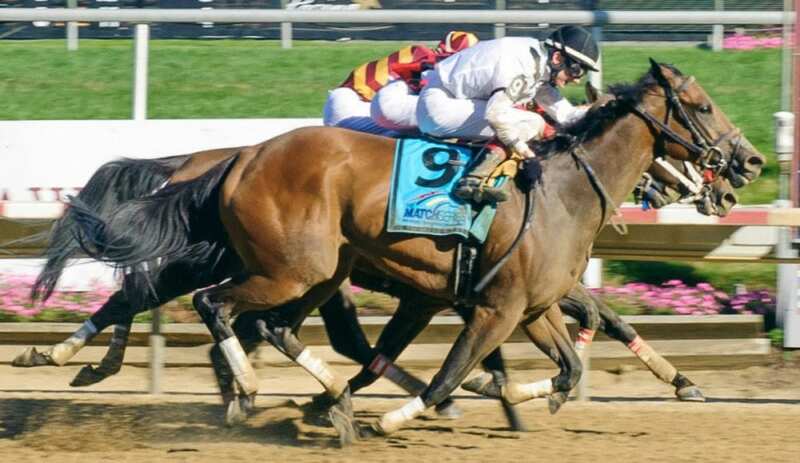 Nellie Cashman, a $75,000 RNA at the Keeneland September yearling sale, won the Grade 3 Virginia Oaks at Colonial Downs and the Dahlia Stakes at Pimlico Race Course. She also finished second in the G3 Valley View Stakes at Keeneland and third in the G3 Ballston Spa Stakes at Saratoga Race Course for regular rider Forest Boyce. In 2013, as a follow-up to her Virginia Oaks victory, Nellie Cashman crossed the wire first in the G2 Lake Placid Stakes at Saratoga but the stewards disqualified her to third for interference. It was a tough beat, but it didn't take away from the filly's quality. Abbott won his first race as a trainer in 2010 in his first start with Brushwood Stable's Pink Palace at Laurel Park. He previously had worked for trainers such as Todd Pletcher, Aidan O'Brien and Michael Stoute, and is closing in on the $3 million mark in earnings. As for Jessica Krupnick, a 5-year-old Uncle Mo mare purchased for $45,000 at the 2014 Keeneland September yearling sale, she has improved with age. Abbott said part of that has to do with issues not uncommon with young horses. “She had some shin problems as a 2-year-old,” he said. “I liked her when she breezed, but she had some things niggling her. Michael Stoute is known for having horses that improve as they get older, and he liked to take his time with them. So I decided to give her some time to grow up. Jessica Krupnick returned in October after the long layoff and raced twice last fall. When the calendar turned to 2018, she won allowance races at Laurel and Parx Racing to start her season and then, because she trains on Tapeta at Fair Hill, Abbott shipped the mare to Woodbine for the G3 Whimsical Stakes at six furlongs. Jessica Krupnick set a fast pace on the Tapeta surface and just failed to last—she finished fourth beaten only three-quarters of a length against the top Ontario filly and mare sprinters in late April. In June she began her MATCH Series quest—a second in the Regret Stakes at Monmouth Park, a win in the Dashing Beauty Stakes at Delaware Park and a third in the Satin and Lace Stakes at Presque Isle Downs & Casino. She has 22 points in the Filly and Mare Sprint—Dirt Division heading into the final leg, the $100,000 Roamin Rachel Stakes at Parx Sept. 15. The long trip from Fair Hill to Erie, Pa., in mid-August paid off, as it gave Jessica Krupnick five more points, more than enough to take the MATCH division title with one race remaining. The leading horse in each division wins $25,000 for the owner and $15,000 for the trainer. The overall championship is worth $50,000 to the owner and $25,000 to the trainer. The Roamin Rachel attracted a field of nine including Liz's Cable Girl, who needs one more MATCH Series start to qualify for bonus money. She is guaranteed second ($15,000 to the owner and $10,000 to the trainer) in her division if she starts. Liz's Cable Girl, trained by Pat McBurney at Monmouth Park and owned by John Cocce, Lisbeth Dodd, Peter Donnelly and Gerard Melley, also would garner a $5,000 bonus for her breeder, Colonial Farms, from the Thoroughbred Breeders Association of New Jersey. Should Jessica Krupnick earn the maximum number of points in the Roamin Rachel—10 for a victory and 5 bonus points for her fourth start in the division—she'll be the one to catch. Three stakes at Laurel will also decide MATCH titles by division and overall championship, but they got pushed back a week to Sept. 22 because of concerns over the possible impact of Hurricane Florence. This entry was posted in Racing and tagged Franny Abbott, match series, roamin rachel stakes, roaming rachel, tres abbott by MATCH Series Release. Bookmark the permalink.